Been diving in Chumphon Pinnacle? Please Vote! Chumpon Pinnacle is one of the most well known dive sites in Koh Tao and is one of the most requested dive sites in the region. It is made up of one long pinnacle that divers can pass through and the top is covered in Magnificent anemones that are full of many different types of anemone fish. The pinnacle stretches down almost like a wall dive, to about 30 meters. As divers descend down the pinnacle, divers will be able to spot many damsels, butterfly fish, angelfish, and bannerfish in the many holes and cracks. Amongst the many crevices and holes of the pinnacle, there are many white eyed moray eels, scorpion fish, shrimps, and crabs. In one spot divers will also find a single Pacific Lionfish, which has made a home in the Southern part of the pinnacle. Off the main pinnacle, there is also a group or rocks that make up a rock formation that is called barracuda rock. This goes down to about 40 meters and there divers will find juvenile yellow-tailed barracuda, chevron barracuda, fusiliers, rabbit fish, and snapper. There will also be many trevally in this region. In the right season, whale sharks can be spotted here and sailfish are found hunting in the open ocean part of the site. Sharks are slowly reappearing at this dive site and there can sometimes be juvenile Bull sharks, manta rays, and reef sharks. A colorful anemone garden with anemone fish covers the top. 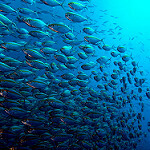 Large pelagic fish such as barracudas, trevallies and batfishes are often seen in huge numbers. The manta rays and whaleshark are regular visitors during the right season. Map of Koh Tao, Chumphon Pinnacle dive site.